With the opening of Jantzen Beach all of Oregon will welcome an amusement spot that sets as a jewel in America’s Great Outdoor Playground – the Pacific Northwest. Clear, sparkling water, over 1,000,000 gallons every eight hours, will flow into the mammoth swimming pools which are considered the finest in point of cleanliness for swimming and competition in America. They present in themselves a model for the nation to follow. Hop the trolley at Broadway and Washington or drive out to the Interstate bridge. You can’t miss it. Right on the highway, set in the waters of the Columbia river on Hayden island. 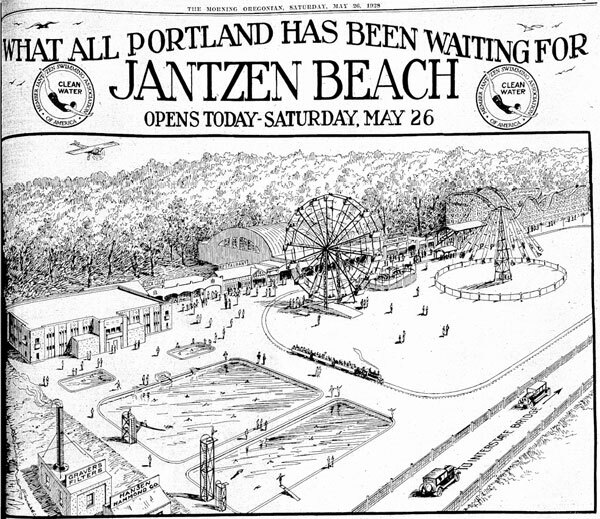 Visit PDXHistory.com for more of the story of Jantzen Beach, including an impressive collection of postcards and other memorabilia.